5th here 8 weeks ago in the Poker Night in America Main Event, Michael Cooper said he came out for today's Day1B of the WPT Rolling Thunder Main Event ready to start pushing his chips around very early. Well, he's definitely at it, but all he was doing was check-calling. 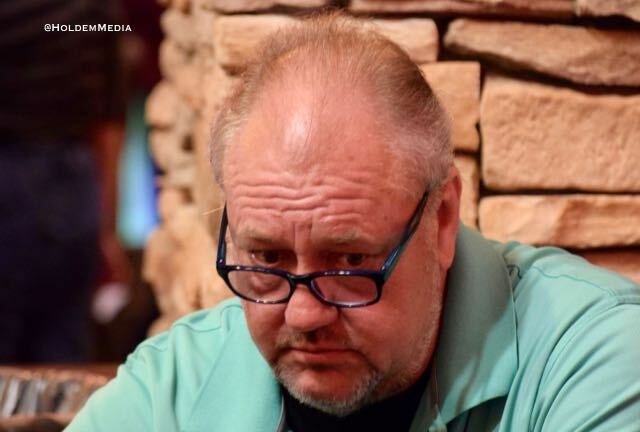 Cooper and one other player flatted an opening raise, then Cooper found a call on a pot-sized flop bet on the Ten-high board. Cooper check-called again when a second Ten hit the turn, and he checked the river also. His challenger moves all-in and Cooper can't believe his luck. Yep, he was holding TT and turned quads.